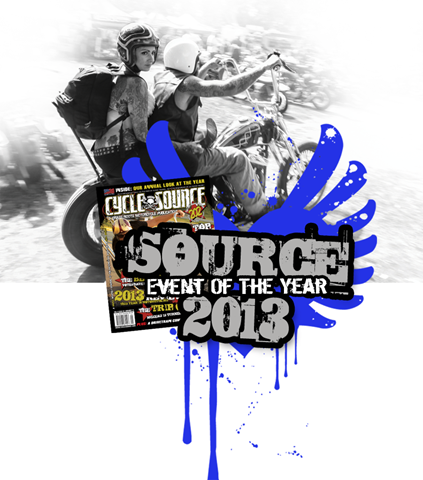 The Cycle Source Magazine year in review issue is out now and Born-Free 5 was named ” Event of the Year”. Thank you to Cycle Source Magazine, all those who voted , those who attended the show and made it worthy of consideration for this award. There are so many great shows out there so we are proud to have made the list. Every year we try to add new ideas, new elements, new people, keep it exciting and folks talking. This year’s 2 day event will keep your interest we promise. We have so many new things happening it’s hard to keep up….even for us. We still have so much to announce so stay tuned. Make your plans now for June 28-29 2014 in sunny Southern California… Born-Free 6 is coming!